Visit nailene.com for instructional videos or professional tips. Perfect fit every time! 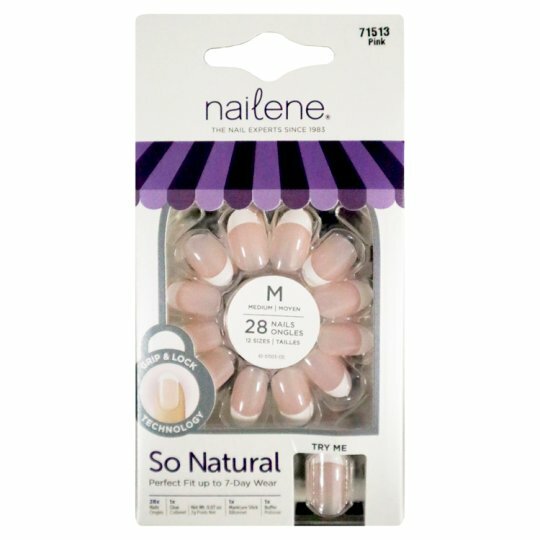 Our So Natural nails are now much thinner to embrace your natural nail for a perfect fit every time. So comfortable, so natural, you won't even know they're there. Packaged in Mexico with parts from: Nails - China, Adhesive Tabs - USA, Glue - Japan, Stick - Mexico, Buffer - China. No damage to natural nails! 1 Glue Net Wt. : 2 g / 0.07 oz. Wear up to a week. Wear beyond 7 days is not recommended. 1 Buff nail then clean. Push back cuticles. 2 Apply glue to artificial nail. 3 Apply glue to natural nail. Trim and file artificial nail. Soak in acetone polish remover until artificial nails dissolve. Do not break or peel off nails. Wear up to 5 days. 1 Choose the size that will fit your nail the best. With your fingers or a pair of tweezers remove the tab from sheet and place sticky side on nail with rounded edge near cuticle, without touching cuticle and sides of the nail. 2 Press the tab flat to the nail, pressing out any bubbles. Peel off protective backing. Apply artificial nail on top and firmly press on. Do not pull nails off - it could cause damage. Press down on nail and slide artificial nail off natural nail. Roll adhesive off natural nail. If necessary use polish remover to remove any remaining adhesive. WARNING WARNINGS: CYANOACRYLATER. DANGER! BOND EYES AND SKIN INSTANTLY. FOR EXTERNAL USE ONLY. KEEP OUT OF REACH OF CHILDREN. If swallowed, seek medical advice immediately and show container or label. Avoid contact with eyes and skin. Do not use if nail is inflamed or infected.